GOODGOD Small Club ~ YO GRITO! 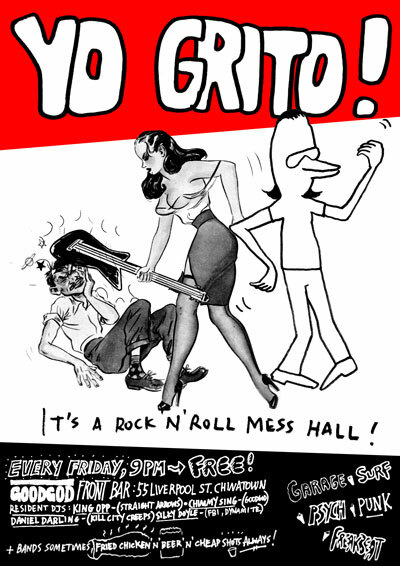 The Goodgod Front Bar’s infamous Friday night Rock’n’Roll mess hall holds down the fort in style. Get freaky to the choicest surf guitar licks, the freakiest of freakbeat, and fuzziest of garage rock. Selected with immaculate taste by an all-star cast of some of Sydney’s most infamous rock’n’roll characters! The Yo Grito gang are ~ King Op from the Straight Arrows, Falshback, The Gonz & Silky Doyle from FBi’s Dusty Fingers radio show. Yo Grito! is free in the front bar every Friday night. The tunes start at 9 and they don’t stop till the early hours!